Wow, what a busy few weeks I have had. There have been a few things I've been looking for while I've been redoing our home. 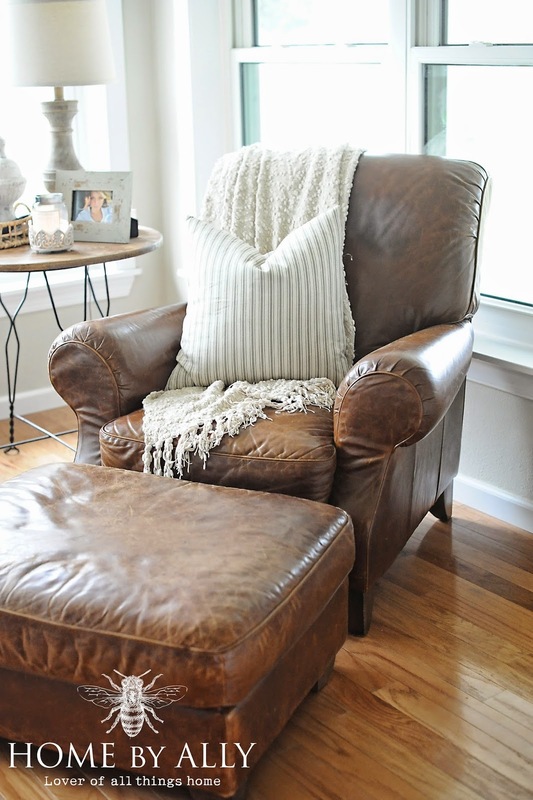 One was either a coordinating ottoman for this chair we got a few months back… or a new leather chair with coordinating ottoman of course. Now, onto the man in the room now. In all of his masculine, rustic, hardy, time worn self. Isn't he pretty? Hehe. I'm still not crazy about the legs on this one either.. only because I prefer a more antique style leg… but that can always be changed just as I said before! Did I mention how SUPER comfortable it was? The dachshunds have already tried it out and one of them is already snoozing! The owner said their family originally purchased him from Ethan Allen…and he's been very well loved. Well, just so happens, that is just the way that I like it! It will remain in the same place that the other chair was in. This is located right near the door from the sunroom to our back patio. We are still hunting for a french door on the cheap for that room. I found these ticking striped Ralph Lauren pillows at TjMaxx a few months ago also. I just love the simplicity of them. I think I want to look for a more interesting lamp… but for now, I am just bringing color and interest in with greenery and some small accents. I would really like to get some darker bamboo blinds and install them on each window (rolled up of course) in this room and then do some nice, thick bright white panels on each end. Hmm, maybe soon! And I can't believe that I have not showed y'all this. If you're a frequent reader, you might know of my obsession with architectural salvage. 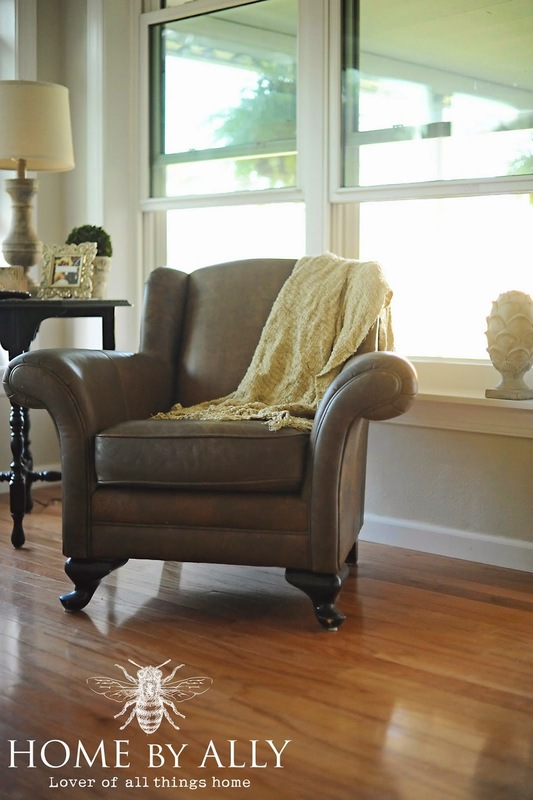 We love to inject character into any of our homes and this one is no exception. These old chippy corbels we bought from a fellow vendor… and we just adore them! All that chippy goodness… all the colors underneath and oh how many stories if they could talk! Here's a detail shot. These are hanging into the entryway into our sunroom. I've been contemplating with framing out a faux framed out column on either side to kinda chunky up this entryway. All in all, things are coming together around here. And I've been doing SO many projects… all of which that I need to post about! I really am loving the direction that things are going… it's just hard to not want everything done at once but hey, we're supposed to enjoy the journey right?